Although I’ve been feeling stressed about being behind in my weaving goals, months ago I’d made plans to visit another weaver, the lovely Hilary at Crazy as a Loom, and I wasn’t going to cancel it. Hilary is talented, funny, gracious, and inspiring, eager to share some ideas about boosting sales and upping my weaving game. She and hubby, along with their sweet dog and cat, welcomed me with open arms, and cooked, too! The visit was short, but totally enjoyable. I came home and got to it! I’d finished weaving a warp before I left, but hadn’t finished either piece yet, so did that first off. Both were going to dramatically benefit from having a human model for the photos, so I took them to the pop up shop on Saturday, in hopes that a customer would be willing to model for me. That didn’t happen, but I did sell a piece, before I even had it tagged! So I took photos on a mannequin, the best I could do. 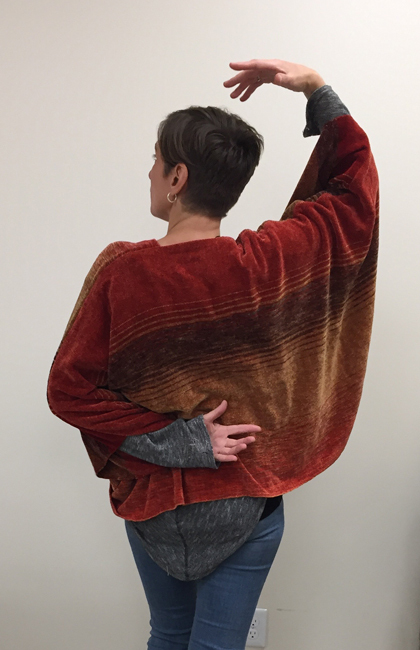 It’s a large cowl, roughly 24″ wide and 32″ around. When worn around the neck, it’s soooo luxurious! There’s plenty of fabric there to pick it up and put it over your head for a loose hood. 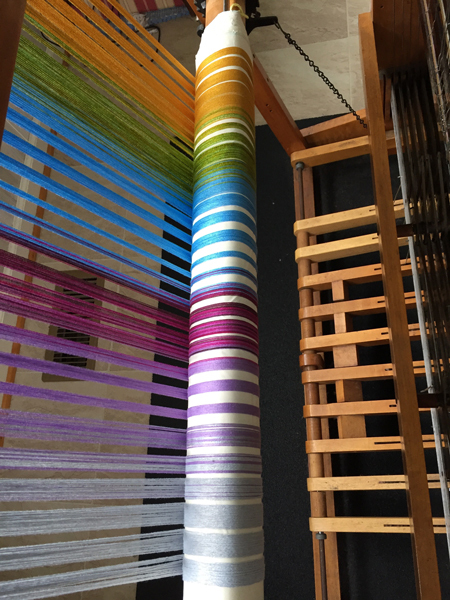 Then on Sunday I took a class at the Weaving Center. I’m not a felter, and not interested in becoming one, but wanted to support the teacher, who is a friend, especially since it was her first time teaching at the Center. I made a felted vessel, which to me, is reminiscent of the human circulatory system. 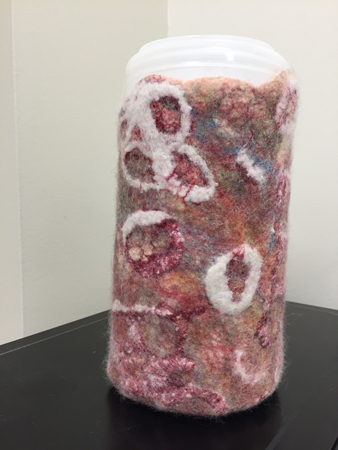 The particularly interesting thing about this class is that the whole point was to take a failed felting project, rip it apart, and turn it into something new. Very fun and creative. 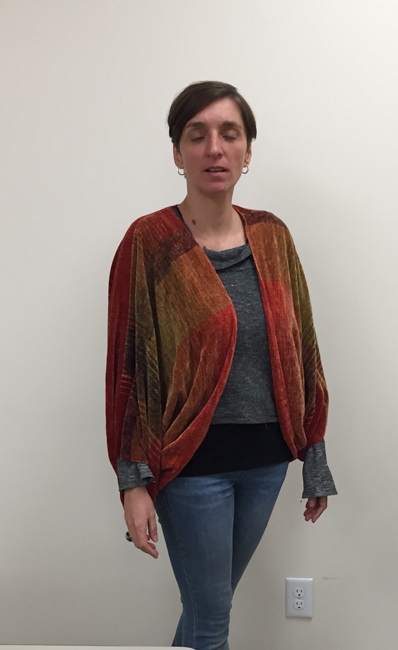 After class was over I got my friend to model my latest garment, a rayon chenille jacket. I am very proud of this piece, and it definitely doesn’t show off on a hanger. Unfortunately in this first photo I caught her with her eyes closed. I would have tossed this photo, but you can see that the front drapes (although I could have done better at setting her up). Then she was willing to mug for the camera to show it to advantage. I wish this sweet young woman lived next to me and would pose for all my photos! Almost as an aside, I finished a piece of rayon chenille I’ve had sitting for months, turning it into a neck cuff/collar with a bit of crochet and some buttons. Now I’ve got another warp on the loom, planned for another jacket and a mobi. This warp is a combination of bamboo and cotton. I really like the way the colors change from all silver at one end to all gold at the other. The interesting thing is that I used several sizes of yarn, from 10/2 to 3/2, so had to think about how I would sett it. If my loom was wider I would have sett the 10/2 at 18 or 21EPI and the 3/2 & 5/2 at 15EPI, but that wouldn’t have fit on my loom. So I sett them at 24 and 15EPI, respectively. Hoping it drapes well. Leaving you with this song from my Girl Scout days. Some lovely items Peg! 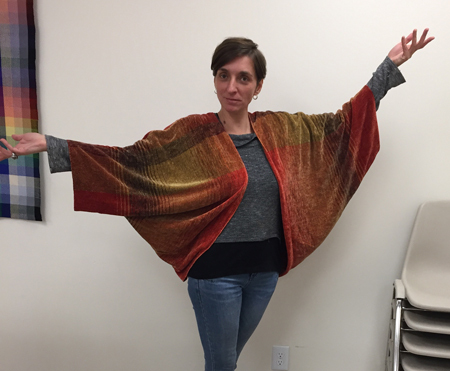 Your model looks great in that shawl/shrug. I can see why that cowl got snapped up. If I had it in my little hot hands I would have bought it too. I LOVE cowls that double as hoods. They remind me of long earned dogs that need snoods to eat! 😉 Now there’s a market! HA! Thanks, Theresa. I like the concept of cowls to hoods, but when I wear a hood, I pretty much always want it tighter than that, something close around my ears, not so Victorian. Yeah, I’ll jump right on that doggie snood market! Wow! 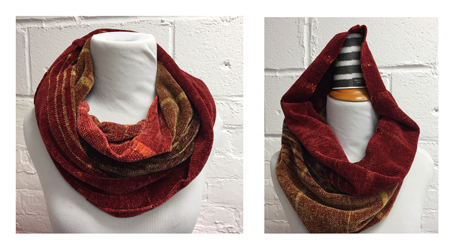 Love those cowls! Lovely, looks elegant and so soft. Do you have them listed for sale somewhere? I’m thinking about them. Ellie – You can usually buy anything you see posted on my blog or in my Facebook Fan Group. The large cowl is gone, although I plan to make more. The small neck cuff/collar is available, and I’ll have 2 more of them in the next few days. And the song from Girl Scout days is . . . .